“Living Room Scene” (The Show-Off Theatre Stills Collection, Schomburg Center for Research in Black Culture). John O’Neal, the co-founder of the Free Southern Theater (FST)–one of the cultural arms of the Student Nonviolent Coordinating Committee (SNCC)–has died at the age of 78. Less well known than the other SNCC institutions, such as the Freedom Singers and the Freedom Schools, the FST played a central part in the 1964 Freedom Summer organizing campaign. From this experience, O’Neal spent a lifetime building cultural institutions, experimenting with the use of theater in the service of social change, and leading the way in fusing art and activism. During his time as a field secretary for the Student Nonviolent Coordinating Committee, John O’Neal worked with Doris Derby on an adult literacy program in Mississippi. O’Neal recalled a fateful night in October 1963 when the idea for the Free Southern Theater was born. While sitting around smoking cigarettes until the room turned blue, O’Neal and Derby were joined by O’Neal’s housemate Gilbert Moses, then a young journalist for the Jackson Free Press. The discussion turned from the struggle for civil rights to the arts. It turned out that all three were fans of the theater. Derby, a painter and dancer, was married to an actor who grew up in Cleveland and frequented the same theater Gilbert Moses grew up attending. O’Neal was an aspiring playwright. They wanted to figure out how to use theater and the arts to aid in their fight for civil rights. O’Neal recalled talking for hours before Derby finally said, “well if theater means anything anywhere, it should certainly mean something here. Why don’t we start a theater.” For over fifteen years, the FST would bring live performance to rural areas and small towns across the South, while working to spread the civil rights message and organizing with it. After his SNCC assignment ended, O’Neal wrote, “I realized that this was not a problem of the South, though it had particular vulnerability there, but of the whole system. This is a lifetime of work.” He was looking for “a coherent solution to the problem of being an artist and part of the movement for social change.”1 The FST was his answer. The FST organized its first tour as part of 1964 Freedom Summer. Historian Joe Street argues, “Of the cultural events and programs that summer, the FST tour was easily the most significant and successful.” The group considered performing plays by Lorraine Hansberry, Langston Hughes, and Ossie Davis, before settling on a play by Martin Duberman, “In White America.” The play, made up of short vignettes in American history, was easily adaptable to a traveling theater with little to no set and a sizable company of actors. 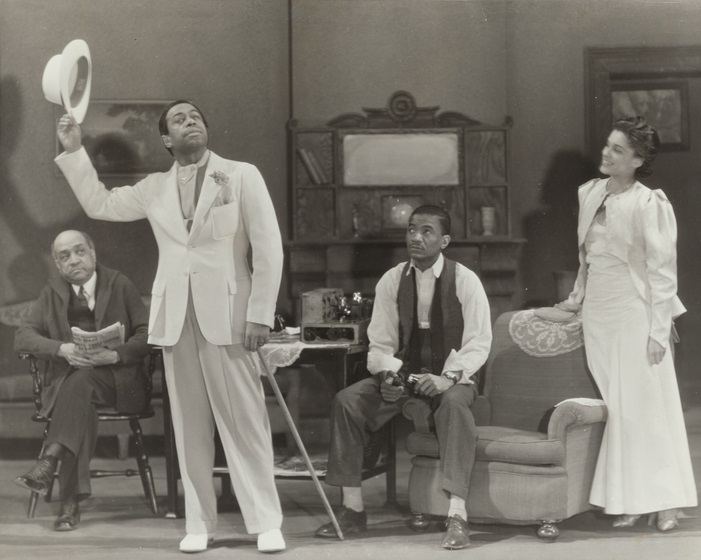 The play addressed both white and Black history, an important component for an integrated theater. During their sixteen-town tour, civil rights activists James Chaney, Andrew Goodman, and Mickey Schwerner were murdered. The actors took it upon themselves to add this chapter of U.S. history to the production, updating the story of racism in America as it unfolded. They also added the singing of freedom songs to make the performances more interactive. The theater made regular trips to New York City to raise funds and publicity for their work in the South. Following the success of the 1964 tour, the group performed Waiting for Godot at the New School for Social Research. Immediately following the show, two FBI agents arrested O’Neal as an “unproven” conscientious objector. He was sentenced to serve two years in Chicago as janitor in a hospital before appealing and having his assignment moved to the Bronx. O’Neal was forced to leave the theater just as it was making a name for itself. The war in Vietnam was heating up, and people across the South were organizing in ever greater numbers for civil rights; however, O’Neal spent the next two years outside of the South. Denise Nichols saw the sentence as an attempt to silence the work of O’Neal and the theater during “the Year of Revolt” as they called the season that included Duberman’s play alongside Brecht’s The Rifles of Senora Carrar. O’Neal returned to the theater in 1969 after his community service was up. The group, now based in the Desire neighborhood of New Orleans, had begun to forge a much closer relationship with the local community while continuing to tour the rural South with plays written by Black playwrights including Ossie Davis and James Baldwin. And while the theater embraced Black Power, O’Neal continued to argue for an integrated theater that was run by Black members and was in service to Black freedom. He claimed that the FST could be both integrated and for Black Power. As the Black Power era continued to develop, the last white member of the theater departed, and they began performances highlighting the independence fights in the Caribbean and Africa and furthering the Black intellectual tradition with plays by Amiri Baraka, Sonia Sanchez, and Ed Bullins. By 1980, out of the original group, only O’Neal remained in the FST. In a dramatic fashion, hosting a jazz funeral for the Free Southern, O’Neal transformed the theater into Junebug Productions. The character of Junebug Jabbo Jones was in part a SNCC invention. According to Jan Cohen-Cruz, the character served “as a representation of the wisdom of common people in the long tradition of cultural characters…keepers of dreams, wily underdogs with strong survival mechanisms.” Characters such as Jones, like O’Neal himself, “pass on a rich cultural legacy” of stories grounded in Black oral tradition. Over the next three decades, O’Neal integrated Junebug Productions into the work of local activists across the South. In New Orleans he worked with the Environmental Justice Project which brought together environmental and arts groups to highlight environmental racism and the high rates of cancer in poor neighborhoods of color. During this time O’Neal developed the idea of “Talking Circles” where people would share stories and use this as the basis to build common ground and the movement for Black freedom. He wanted to foster dialogue between people with different perspectives. He saw this as an advance over argument and as a space to generate content for performances that would stimulate further movement building in the community. While his style of organizing, writing, and performing had evolved, the central project remained the same: using art as a means to further the struggle for freedom and justice. Denise Nichols explained the work that she, O’Neal, and the members of the Free Southern undertook: “The political question—the relationship between politics and art; between what we and our peers in the ‘movement’ were doing—consumed the largest part of the philosophical struggle.” The lack of plays written by Black people and about Black experiences at the time, she attributed to the lack of theaters “where black writers can develop.” Nichols continued, “The theaters that do exist will remain more potential than real until the form itself is seen in the black community as a meaningful and useful vehicle for the expression and clarification of experience.”4 John O’Neal spent a lifetime writing plays and building a theater and a movement that changed that reality. Fusing the struggle for Black Freedom with the work of creating a compelling and beautiful theater were the lifelong labors of John O’Neal. The world is a richer place for his decades of work in furthering both.